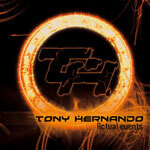 Spanish guitar wiz Tony Hernando is back with another instrumental fireworks Actual Events. Late with Spain's Saratoga, a melodic power metal band, Mr. Hernando has found to time to nab some studio time with talented drummer and long time friend Mike Terrana (Rage, Artension, Pell, Emir Hot and about a bizillion other major acts). As expected Hernando does not disappoint delivering sizzling and speedy fret work throughout Actual Events. Guitar fans will be delighted, no doubt. Even with the usual suspects, shred and more shredding, Hernando seems to have turned his enthusiasms more towards composition than fret board histrionics. Songs like 'Stones Of Silence' and 'Land With No Sun' show greater depth and progression in melodic heavy metal guitar than the more obvious shredfest pieces like 'Eyes Of Orion.' (Regarding the opener, if you're jaded and suspicious of instrumental guitar projects because they seem merely exercises in self-indulgence, then you won't get far on this album. Begin with second track and you'll do better.) Additionally, 'Deadly Kiss' is another noteworthy piece that minimizes (generally) the neo-classical wiggling for more tempered and direct fret work. But the real treat is 'Side Effects' where Tony adds some tasty rock fusion into the mix; more of this please! On Actual Events, veteran guitar guru Tony Hernando delivers the goods: bristling and lightning guitar work. Yet, this time the song composition shows greater depth translating into greater movement beyond mere guitar shredding (although it's quite abundant). And this is change for the better. Very recommended! On Actual Events, veteran guitar guru Tony Hernando delivers the goods: bristling and lightning guitar work. Yet, this time the song composition shows greater depth translating into greater movement beyond mere guitar shredding (although it's quite abundant).